The eligibility rate for receiving regular Employment Insurance (EI) benefits was 84.3% in 2017, little changed from the previous year. The eligibility rate was also little changed for men and women, but was down for youth and those aged 45 and over. Among recent mothers, 78.5% had insurable employment in 2017, up 3.0 percentage points from 2016. Quebec, which provides separate maternity and parental benefits through the Quebec Parental Insurance Plan (QPIP), continued to have higher rates of insurable employment among recent mothers and receipt of benefits than the rest of Canada, and a higher share of spouses or partners intending to claim parental benefits. Across Canada, the average duration of paid and/or unpaid leave for recent mothers who had worked as an employee within the previous two years was 11.6 months, with just over one in five of these mothers taking or intending to take more than 12 months away from work. The eligibility rate for receiving regular EI benefits was 84.3% in 2017, little changed from 2016. Although the overall rate was little changed, the rate declined for youth and for men aged 45 and over. In 2017, 749,000 unemployed people had contributed to the EI program, as they had paid premiums in the 12 months preceding their unemployment spell. This represented 63.0% of all unemployed people, down from 65.3% in 2016. Men accounted for the entire decrease in the number of contributors. The national ratio has ranged from 61% to 65% since 2010. In addition to having contributed to the EI program, unemployed individuals had to meet the criteria for a valid job separation and have accumulated enough insurable hours to receive regular benefits (see note to readers). Of the 749,000 unemployed contributors, 81.0% or 607,000 had a valid job separation in 2017, down 88,000 (-12.7%) from 2016. The number of unemployed and the number of unemployed contributors also decreased markedly compared with 2016. 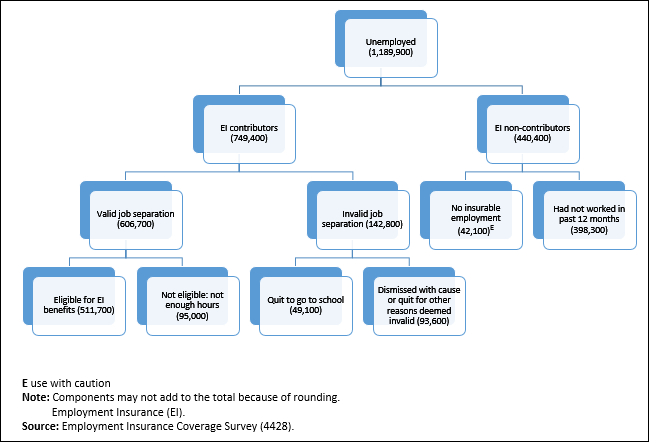 Of the unemployed contributors with a valid job separation, 84.3% or 512,000 had accumulated enough insurable hours to be eligible to receive regular EI benefits in 2017. In 2017, eligibility rates for regular EI benefits varied across Canada, ranging from 69.7% in Saskatchewan to 96.8% in Newfoundland and Labrador. Compared with the previous year, the EI eligibility rate decreased the most in Saskatchewan (-9.2 percentage points) and Nova Scotia (-7.3 percentage points), primarily the result of fewer eligible contributors. 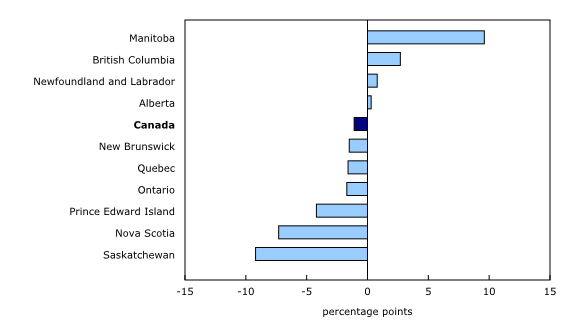 Prince Edward Island (-4.2 percentage points) was the only other province to see a notable decline. In contrast, the rate rose in Manitoba (+9.6 percentage points), the lone province to report an increase, offsetting a decline in the province in 2016. The eligibility rate was little changed in the remaining six provinces. Men accounted for more than 6 in 10 unemployed individuals who had contributed to the EI program and had a valid job separation in 2017. The higher proportion of men reflects the fact that men generally have a higher unemployment rate than women. According to the Labour Force Survey, the unemployment rate in 2017 was 6.8% for men and 5.8% for women. In 2017, 85.8% of unemployed male contributors with a valid job separation had enough insurable hours to be eligible to receive regular benefits, little changed from 2016. The rate in 2016 was the highest since 2013. For women, the eligibility rate was 82.1%, also little changed from 2016. Overall, 66.8% of unemployed men contributed to EI in 2017, compared with 58.1% for their female counterparts, as fewer unemployed women had paid employment in the previous 12 months. For youth aged 15 to 24, the eligibility rate fell from 50.8% in 2016 to 40.7% in 2017, the lowest rate since comparable data became available in 2003. The decline partly reflects the fact that, among youth, the number of contributors who accumulated a sufficient number of insurable hours declined at a faster pace than the number of contributors with a valid job separation. Since 2003, the eligibility rate for youth has ranged from 41% to 63%. Among people aged 45 and over, the eligibility rate fell to 90.2% in 2017, down from a recent high of 94.0% in 2016.The eligibility rate for people aged 25 to 44 was little changed over the same period. The eligibility rate for youth has historically been lower than the rate of older age groups, as youth are less likely to accumulate a sufficient number of insurable hours and are more likely to have an invalid job separation. Of the 1.2 million unemployed people in Canada in 2017, 441,000, or 37.0% had not contributed to EI, making them ineligible for regular benefits. Despite a decline in the number of non-contributors, the proportion of non-contributors was slightly higher than in 2016 (34.7%) due to a notable decrease in the number of unemployed from 2016 to 2017. Among unemployed people who were EI contributors in 2017, about one-fifth or 143,000 were ineligible to receive benefits because they left their job for a reason not deemed valid by the program. This rate was little changed from 2016. Reasons not deemed valid by the EI program include voluntarily leaving a job without just cause or being dismissed for misconduct. In 2017, 78.5% of recent mothers (those with a child aged 12 months or less) had insurable employment, up from 75.5% in 2016. 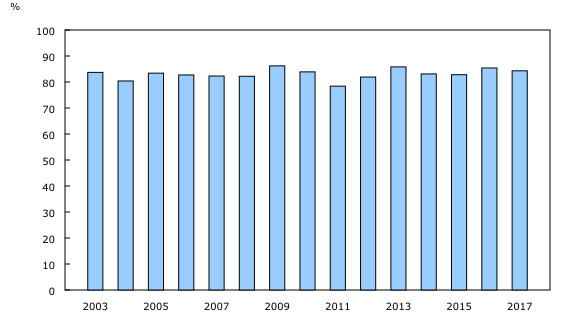 This rate has been relatively stable since 2003, ranging from 74% to 79%. Among these insured mothers, 89.9% received maternity and/or parental benefits in 2017, little changed from 2016. Quebec, which provides separate maternity and parental benefits through the QPIP, continued to have a relatively high share of recent mothers with insurable employment (91.1%), and the highest proportion of insured recent mothers receiving maternity or parental benefits (97.1%). The share of new mothers with insurable employment who received maternity or parental benefits in the rest of Canada was 87.2%, little changed from 2016. Across all provinces, the average duration of paid and/or unpaid leave taken or planned by recent mothers who had worked as an employee within the previous two years was 11.6 months. Just over one in five (21.7%) of these mothers took or planned to take more than 12 months away from work. At the national level, the share of spouses or partners of recent mothers who claimed or intended to claim parental benefits was 29.1% in 2017, virtually unchanged from 2016. In Quebec, the proportion was 81.2%, also little changed from 2016. The share of spouses or partners claiming benefits is typically higher in Quebec, as the QPIP includes benefits that apply exclusively to the second parent. In the rest of Canada, the proportion of spouses or partners of recent mothers who claimed or intended to claim parental benefits was 11.9% in 2017, little changed from 2016. The most common reasons mothers reported for their spouses or partners not claiming or intending to claim benefits were "mother wants to stay home" (37.4%) and "spouse not eligible for EI" (18.0%). The number of insured hours required to qualify for regular benefits varies across geographic regions, ranging from 420 to 700 hours, depending on the region's unemployment rate. The higher the unemployment rate, the lower the number of hours required to qualify for benefits. For maternity and parental benefits (excluding Quebec), the required number of insured hours to qualify for benefits is 600. In 2017, the total sample size was 14,266 people, composed of unemployed individuals (as defined by the LFS) and other individuals who, given their recent status in the labour market, were potentially eligible for EI. In January 2017, EI policy changes came into effect that reduced the waiting period for receiving EI from two weeks to one week. The waiting period is a period of time that must be served before a claimant can begin to receive EI benefits, except for those who have their waiting period waived or deferred. Also, effective December 3, 2017, further changes included the introduction of extended parental benefits, allowing parents to choose between receiving benefits for up to 12 months at the standard rate, or for up to 18 months at a lower rate. More flexibility was also introduced for pregnant workers as to when they can start receiving maternity benefits. The product Employment Insurance Coverage Survey: Public Use Microdata Files, 2017 (Catalogue number89M0025X) is now available. To enquire about the concepts, methods or data quality of this release, contact Martha Patterson (613-299-3942; martha.patterson@canada.ca) or Client Services (toll free: 1-866-873-8788; statcan.labour-travail.statcan@canada.ca), Labour Statistics Division.